and a comfortable tip. The bottom two tubes are 4.6 mm in diameter and were a special request. I love custom orders and I know every practitioner has their own preferences. I also learn a lot from the desires of each individual practitioner and find a great deal of satisfaction in handling different shapes and sizes of each tool. Their is no right or wrong, just different. The key, in treatment, lies in uniting the tool, technique, patient and practitioner. These heavier tubes feel very massive and therefore more yang, but the softness and bluntness offer a substantial yin gentleness. An unusual combination. 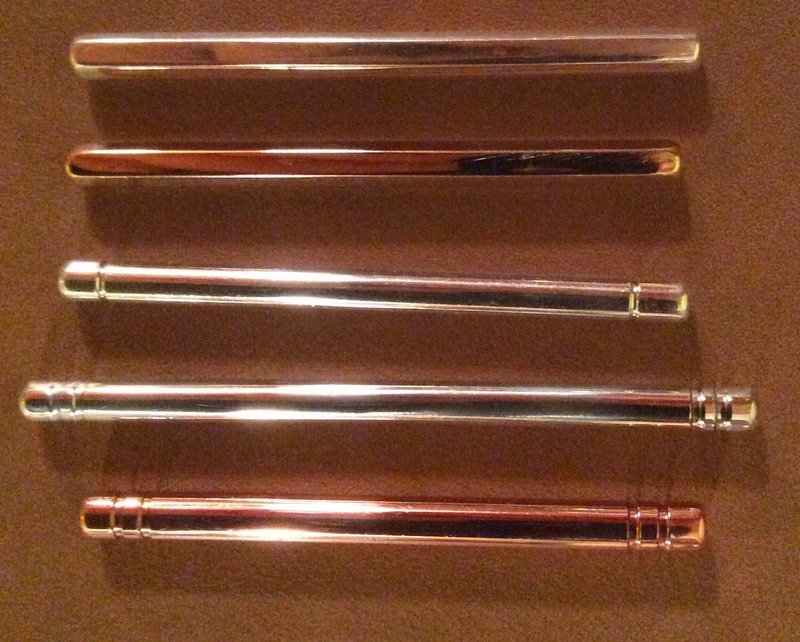 Above are four examples of zanshins. This may seem confusing to some because many do not realize that yoneyamas are considered zanshins as well. Stephen Birch references the Ling Shu as describing the zanshin as "having a large head with a sharp tip that is inserted very shallowly. "* This description is rather vague and explains why there are differing interpretations of this tool. 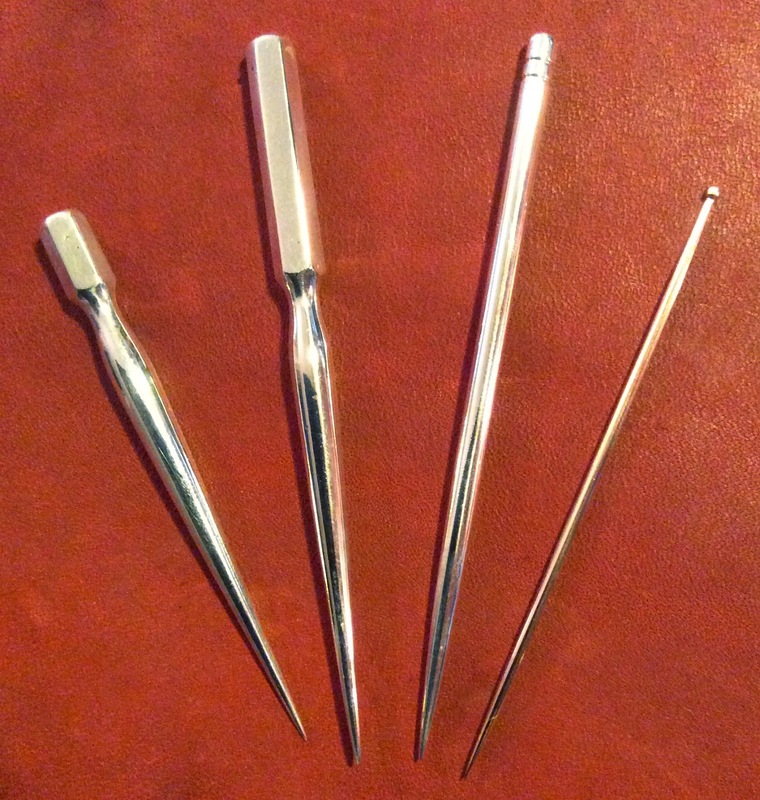 Of course we do not insert the yoneyama in modern practice, but the sharp point remains useful for point stimulation. The omeyama yoneyama shown is my own embellishment of the classic yoneyama shape (top left). The classic yoneyama shape that we are all familiar with has a very playful and active energetic to it. I believe this is due to the highly dichotomous nature of the tool; a large "yang" blade combined with a small sharp point. 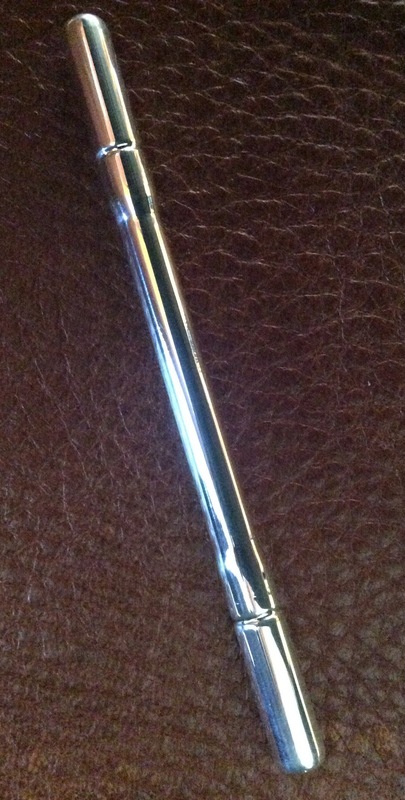 This makes the tool very top-heavy and urges it to oscillate when being used for point stimulation. The length of this tool is fairly short (less than 2") which lessens the imbalance of mass caused by these two opposing ends. This short length also makes the tool feel "handier," fitting in the fingertips and being used for quick and active stroking along the meridian with the blade or scattering with the point. The elongated yoneyama shown is my own variation of the classic shape and makes an excellent pediatric tool. The extra length allows the pointed end to have a more stable feel for point stimulation while the blade can still be used for invigorating qi and blood on the surface. The blade of both of these tools is very angular/sharp/yang and is quite invigorating/dispersing compared to the the yin nature of an enshin ball. The tool that we generally think of as a "zanshin" is a long cone made by folding a pie shaped section of metal into a cone shape. This creates a pointed end and a hollow and curved bladed end. 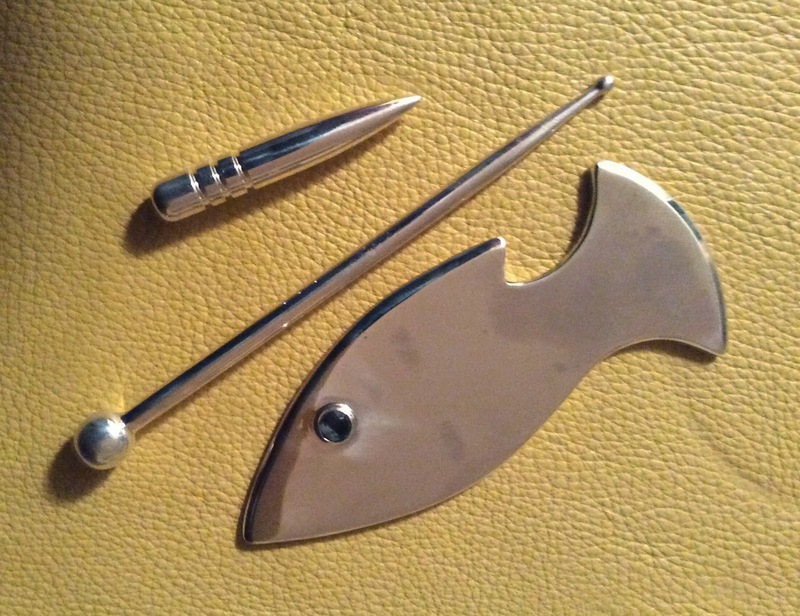 The bladed end can be used for point stimulation as well as being used for "pocking" the surface. 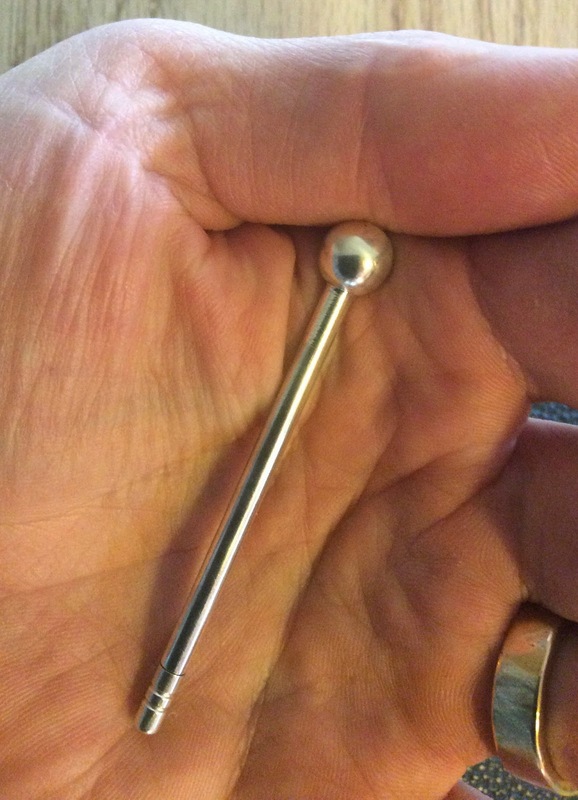 This pocking is accomplished by lightly tapping the hollow end so that it lands on the skin in a parallel plane so that a suction cup popping sound is made. This is another method of invigorating qi and blood flow. The zanshin shown is a variation of the classic folded tool described above, except that it is made of solid silver round bar that is forged into a point and hollowed on the other end. I prefer making them this way and like the added mass obtained. The tool is also smaller in diameter than the folded form, which gives both ends a much more precise feel. The pocking effect is similar, although I would say it is slightly stronger (more dispersive) with the smaller hollow. The reason I believe this to be true is simple physics. The smaller hollow has a smaller surface area contacting the skin so the force is divided across that area. For this reason, the smaller hollow end should be used in a more gentle way than its bigger brother. The zanshin traditionally had a pointed end, but this version can be made with a ball end if you prefer (as shown). *Birch, Stephen & Junko Ida, Japanese Acupuncture. Paradigm Publications, Brookline, MA. 1998. pg. 46. 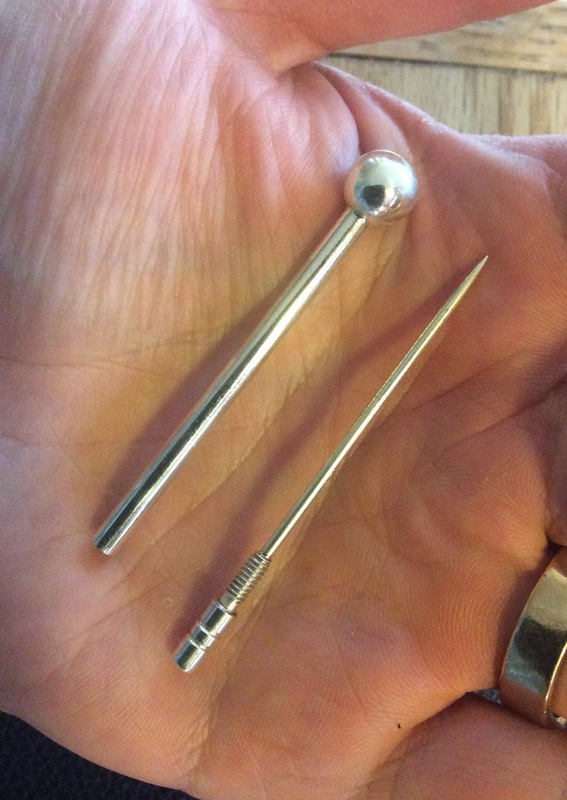 Often, I have my own bias towards heavier weight acupuncture tools. I think it comes from our innate misunderstanding and insecurity to believe that more is better. When we see that a heavier gold teishin is much more expensive, without thought, we believe that it must be better. The opposite may be true. Recently, a toyohari practitioner asked me to make him a very small teishin 1 mm diameter by 57 mm long with a very small round ball end a subtle tapered blunt end on the other. It is a joy to work with practitioners that know what they want and why they want it that way. From their need creates the necessity and expands my own thinking about the tools and how they are used. In these instances I am not the designer and become merely a craftsman for the execution of that design. Often the problem solving that comes with these new designs is reward in itself. In this instance, the challenge is creating a uniform and precise ball end on such a small diameter wire that wants to bend away from each file stroke. I must admit the first 5 attempts were failures, but I am excited that, after a bit of practice, I can produce them consistently. 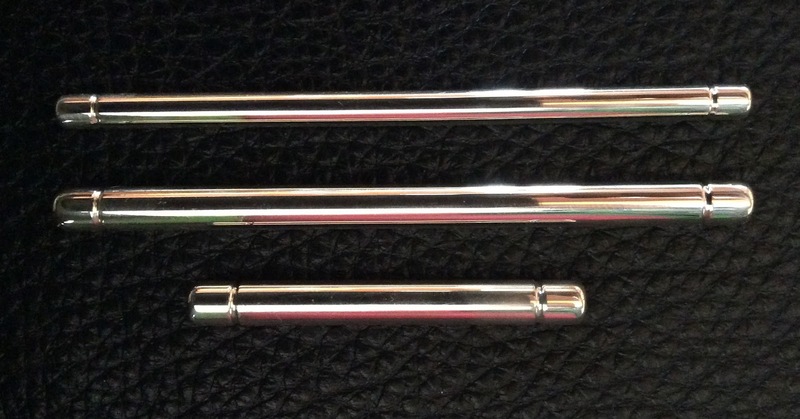 The gold teishin in the above picture, left is a fairly standard, although heavy, 14 gage (1.75mm) by 3" size. 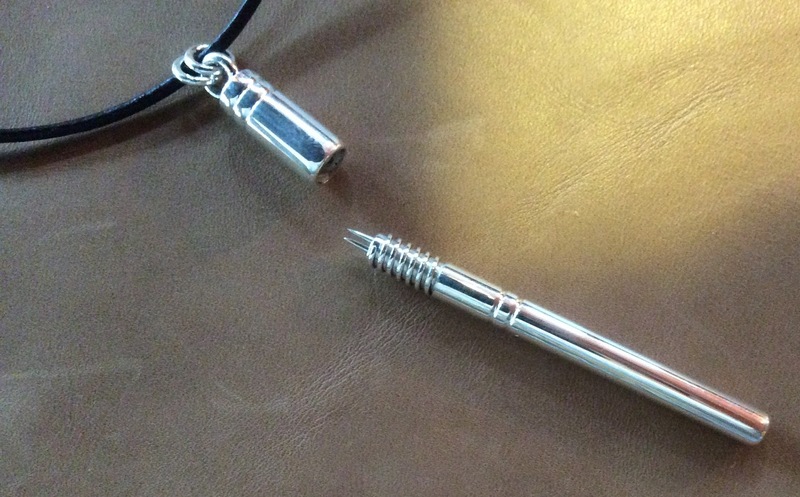 The center teishin is sterling silver 16 gage (1.25mm) by 58mm long. 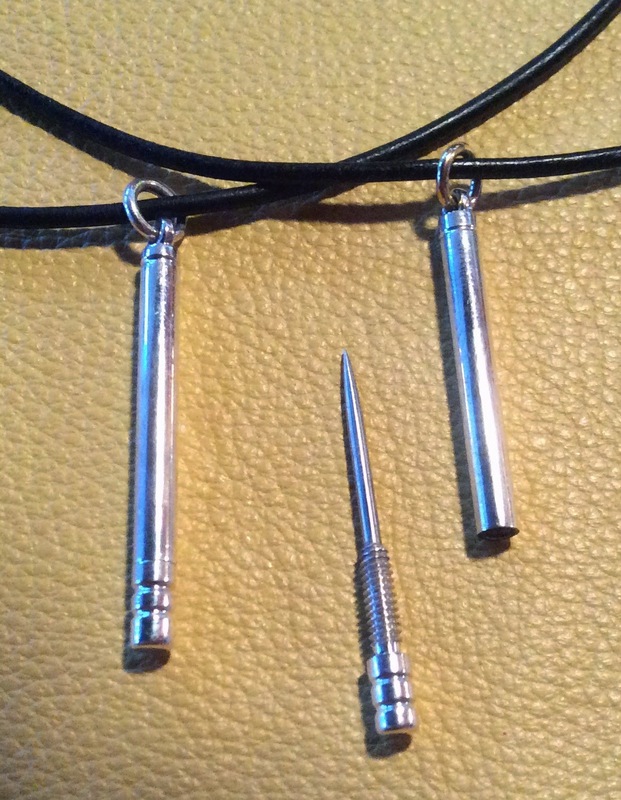 Finally, the "micro" teishin on the right is 18 gage (1.0mm) by 57mm long in 18k royal yellow gold. I consider both the silver and gold teishin to be in the "micro" category. The silver teishin needs to be made slightly heavier to compensate for the lighter weight and decreased rigidity inherent to silver tools. By dropping the weight of the teishin, we gain precision, delicacy, and specificity. The small diameter also facilitates a consolidated oshide which is crucial for optimum tonification. All this at a lower price point that will make owning a gold teishin within the grasp of many beginning practitioners. The yoneyama has always been a very versatile tool for meridian therapy. I added a little flare to this one by cutting out an Om symbol in it. 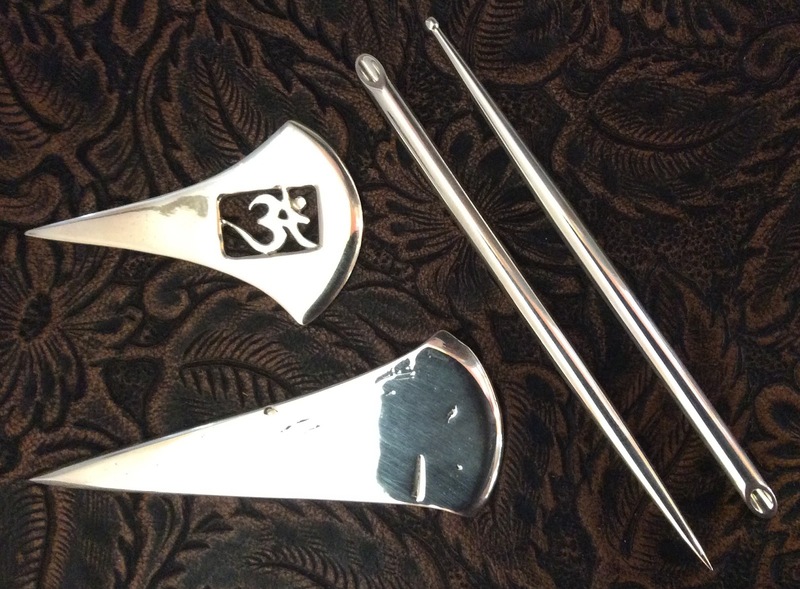 The Om also adds a degree of grip and control on the tool. 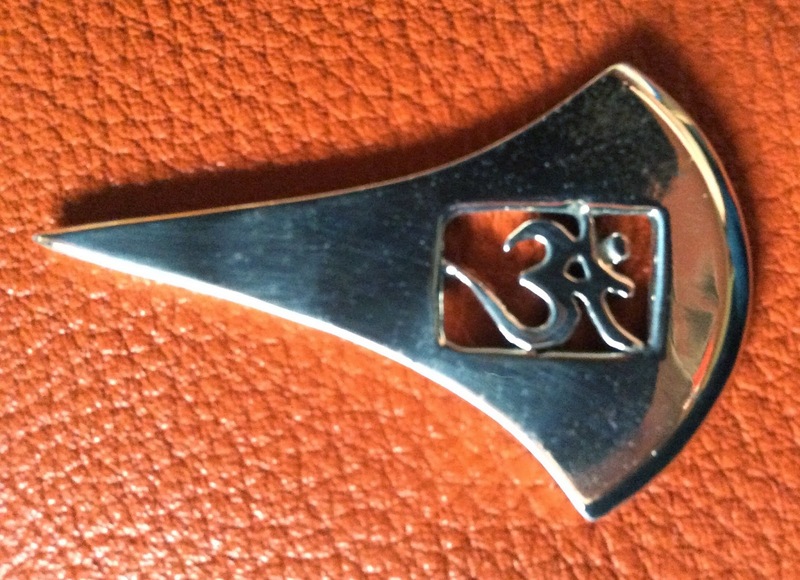 So if you are an Ayurvedic practitioner as well, this may be just the tool to get your prana flowing! 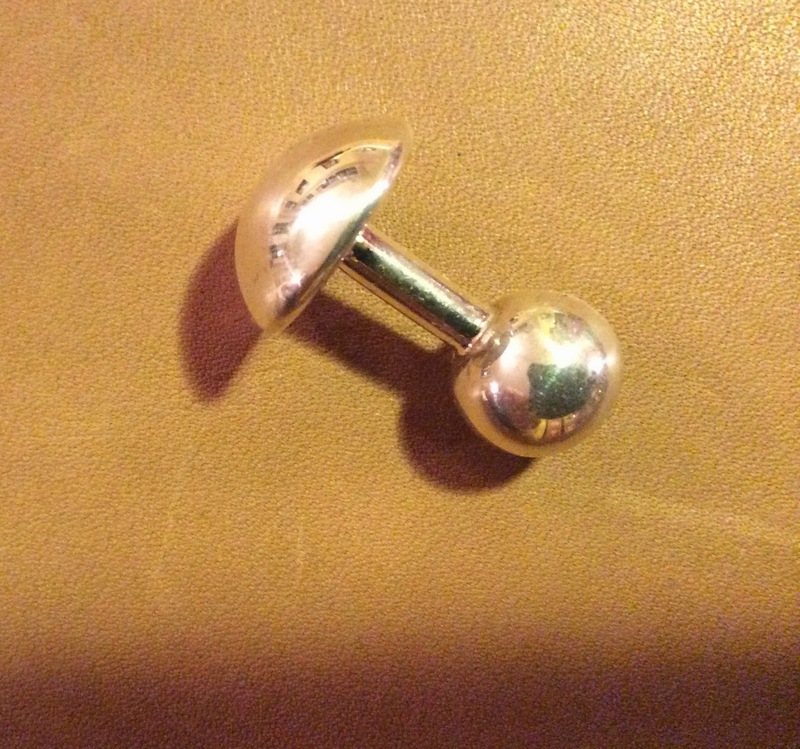 1 3/4" by 1 1/8" sterling silver. Teishin length and balance are very critical to the way the teishin feels in the hand. When a teishin is made too long the practitioners attention begins to follow the tail end of the tool rather than the stimulating end. This also occurs when a teishin has one heavy tip and one fine tip. Of course, we make teishins in this way because we like the benefits of a multifunctional tool. With even larger diameter teishins we add a third surface for treatment; the length of the tool (for brushing or rubbing along treatment areas). In nature we see that some things in life are "weight forward" such as a fish or a birds wing cross-section and they are more efficient in moving forward or have a forward qi. I have been wanting to make a teishin designed primarily around one functional end with the tool itself having a forward qi energetic. This teishin is shaped like an elongated teardrop with most of its mass lying within the fingertips. Another way to understand this tool is to imagine it in water. If you held it horizontally and then released it in the water the tip would rotate downward and the tip would direct the tool straight down. The tip can be made sharp, ball ended, or blunt while the tail end has a long graceful taper. Having this long taper ensures the practitioner has a strong awareness of the tool's vector or directionality. Of course the tip of the tail end may still be used for treatment but you will miss the forward qi effect once you have experienced it! Above you will see several different teishin designs that I have made over the years. The left two were designed by my Japanese acupuncture teacher from Pacific College of Oriental Medicine; K.C. Conover. The original was a chrome plated dental tool that he had shortened the handle and sharpened the tip of. He lent me the original tool so that I could make a mold and produce a few copies for him. It is an excellent design, but I feel that it is a bit top heavy and tends to make one's concentration go away from the point being stimulated. 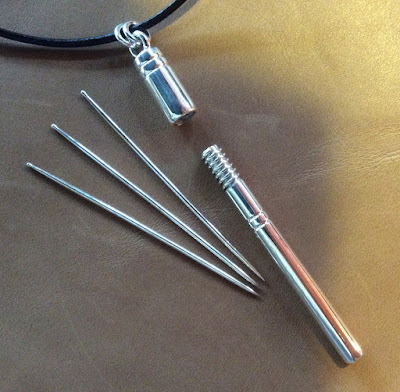 Of course with acupuncture tools everything is a compromise; having the heavy top also makes the top useful as a heavy probe or even to be stroked along the meridian as you would use an enshin. The shortened version of this tool on the far left has a more balanced feeling and makes an excellent pediatric tool. Although versatile, if I were to only have one teishin, one of these two teishins would not be it. In my opinion the most important aspect of the teishin is it's fine tip. 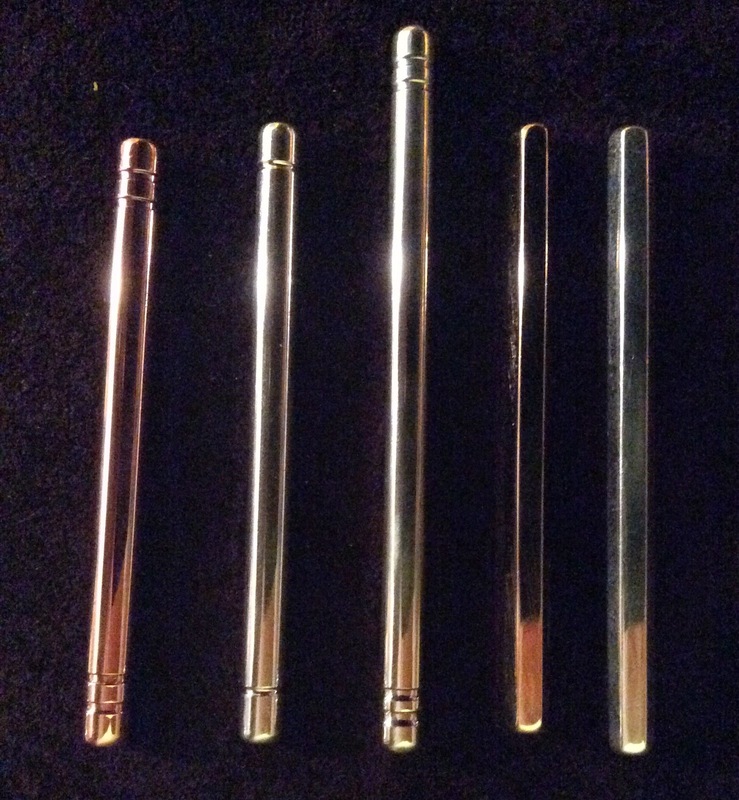 The two teishins to the right are a heavyweight silver teishin with machined end and a "classic" style 18k gold teishin. The heavy silver teishin is my personal favorite. 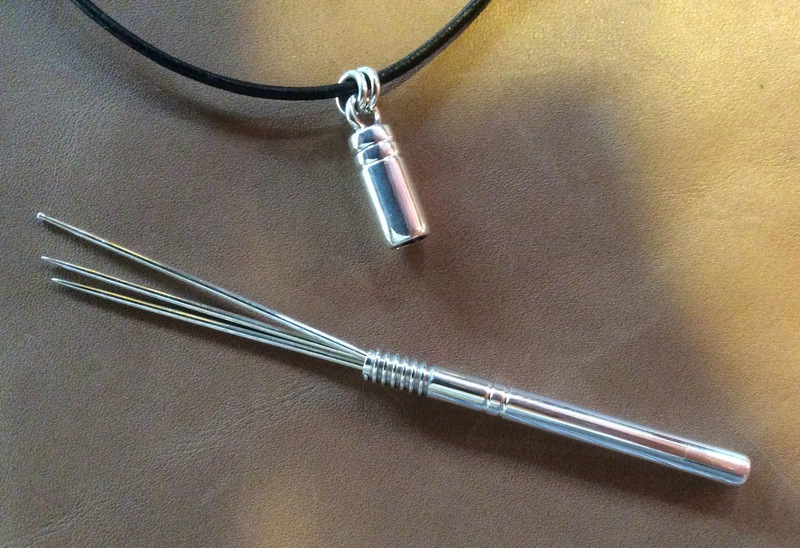 It is made of 7 gauge sterling silver rod that is forged with heat and hammer to form the fine point. This forging process aligns the grain of the silver making it both hard and stiff, contributing to a durable tool. The milling on the blunt end gives it a little style while adding some traction for deeper pressure. Because the blunt end is a larger surface area the pounds per square inch (or fraction of an inch in this case) decreases drastically compared to the sharp end. In this way more pressure must be applied to this end of the tool to create change in the meridian. The end milling gives just a little extra purchase and allows the user to focus on the point and not the gripping/ pinching of the shaft. The gold teishin is more or less a classic or common teishin design. 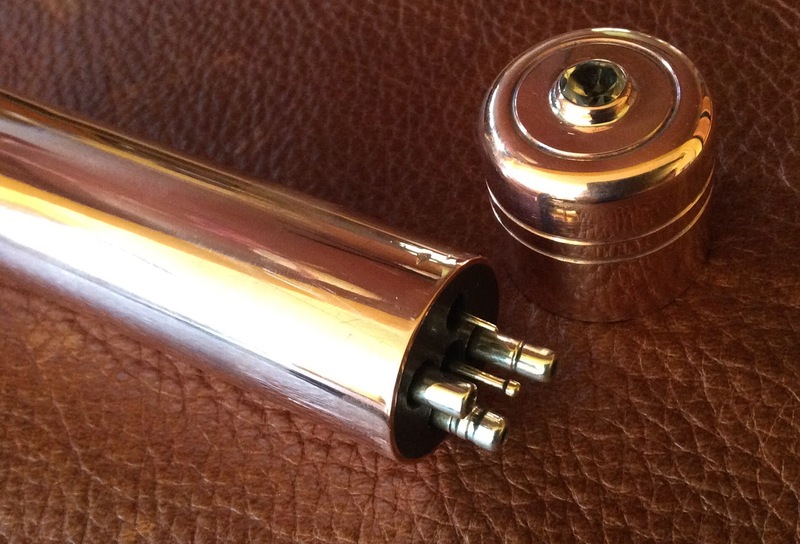 It is made of 16 gauge gold rod, so significantly smaller diameter than the silver teishin. 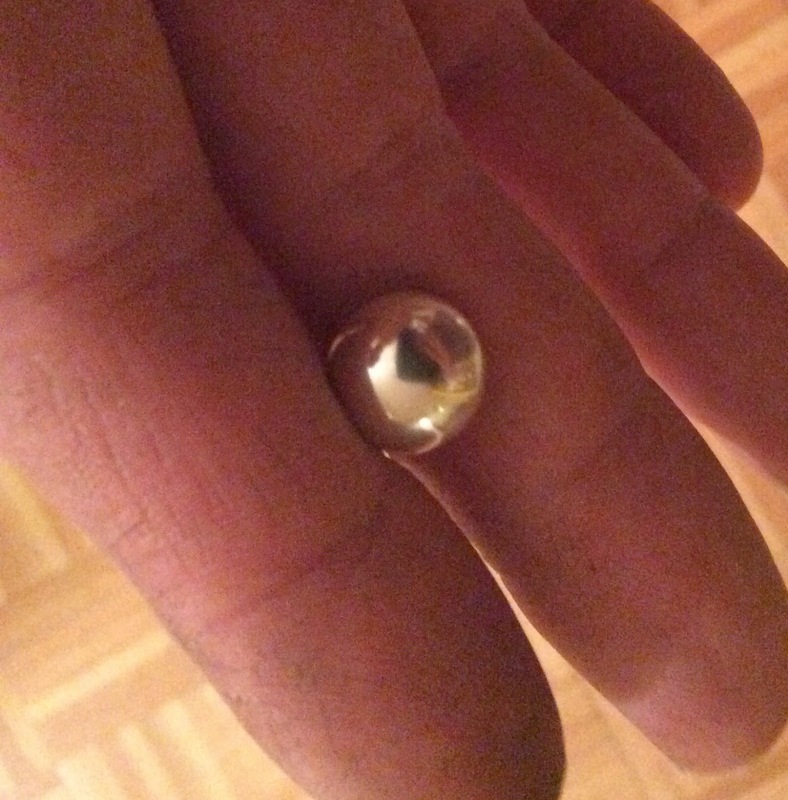 18k gold is heavier (by a factor of 1.5) and stiffer than sterling of the same diameter. This allows us to make a fine needle-like teishin that still retains good stiffness and mass to feel substantial in the hands. 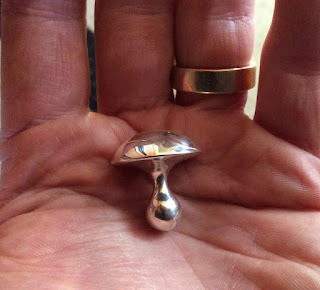 When I make a sterling silver teishin in the classic design I prefer to use at least 2 gauges heavier to compensate for the lower mass and stiffness of this material. Conversely, I find a gold teishin made of 7 gauge wire to be a bit too heavy in the hands and prefer the 16 gauge (This is also nice because the cost differences between the two sizes is substantial). The lengths of the two teishins on the right are 3.5 and 3 inches. Here is a general outline of how I price my tools. I will list the tools I generally sell the most frequently, but I am happy to make any variation or custom order that you would like. Gold prices are subject to change. Please contact me at metalanton@yahoo.com or call/text me at 406-780-1387 for more information. All the above teishins can be made with a zanshin end for the same cost. Sterling silver derma roller with copper handle: coming soon! 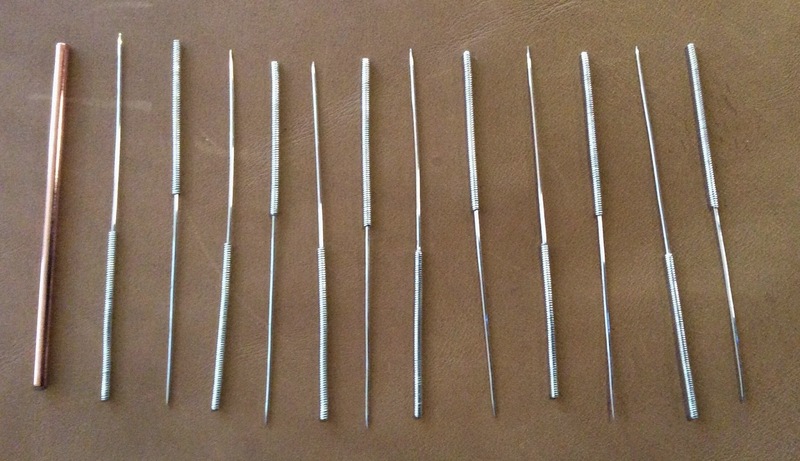 Over the years of making acupuncture needle insertion tubes I have found that many people don't quite understand the need for them. The majority of my orders have been for teishins, and although I believe teishins are an important part of every acupuncturists tool kit, I think practitioners are missing out on the most important tool for their arsenal. One of the biggest reasons for their usefulness is that, since we use needles on every patient, we will use a guide tube on every patient. As a student I used the stainless steel hexagonal guide tubes that are commonly sold. At that time I didn't find any fault in them. Even after making my first couple of 18k gold tubes I was not sensitive enough to notice the differences between them. When I made my first silver tube, I had a profound realization of their value. I was needling the abdomen of a patient when I noticed the tube itself had an amazing softness. 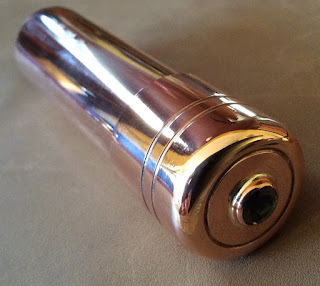 The highly polished surface that can only be achieved on non-ferrous metals gave the tube a non-metallic feel. 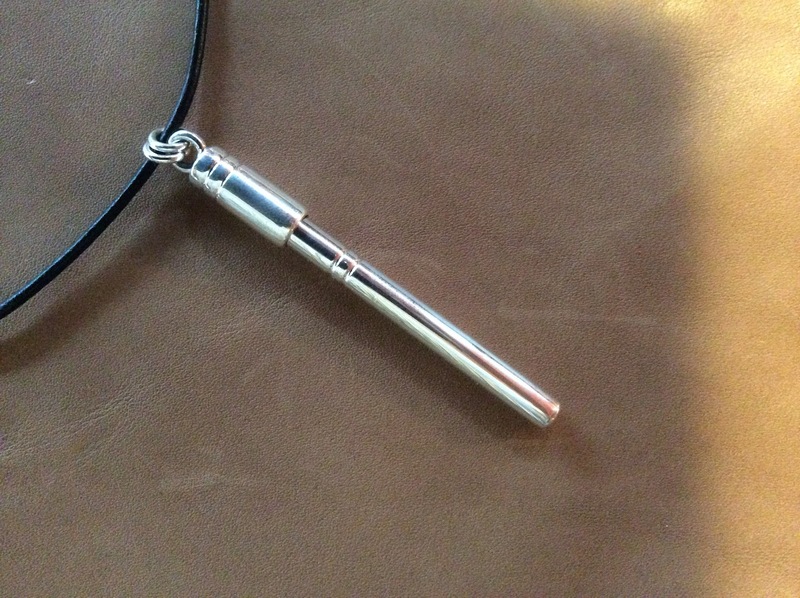 While the stainless tubes I had been using felt inert and lifeless, the silver tube was gentle, warm, and receptive. As I palpated this particular patient's abdomen I began to carry myself with the same energetic that the tube possessed; quiet, calm, and gentle, I began to percieve the acupuncture points on a more subtle level. Myself becoming soft and able to receive. My palpation became more gentle, the tube gliding into the points as if some invisible force were directing it there. For this simple lesson they have taught me, I still find myself most enamored with the sterling silver tubes over the other metals. In 2006 I began the website; ACUTUBE.com specifically for the sale of gold and silver acupuncture insertion tubes (this website is no longer available). It actually began earlier than that in my final year of acupuncture school at Pacific College; 2003, when my Japanese acupuncture teacher asked me to make him a gold tube. I first wanted to buy manufactured tubing with a heavy wall thickness. I could find companies that would make such tubing but they wanted orders of at least 20k dollars to make this special and unusual size. I then attempted to make tubing by drilling both ends of some gold rod in special jig I made for my drill press. This was a painstakingly slow process that was hardly accurate enough. The greatest hazard was that these small drill bits were prone to binding and would often break inside the tube, wasting the precious gold. I did come up with a couple tubes at that time but I never thought I would want to do it again. A couple years later my father found an old Emco metal lathe at an auction and I became its lucky new owner. Although making tubes was now more accurate, the added power of the lathe was more prone to broken bits. After making 20 tubes or so and learning many little tricks I had learned how to drill the bores for the tubes accurately, and without breakage! Now, I could produce a heavier weight tube which felt more substantial and had gentle edges for a very comfortable needle insertion. My brother, his wife and children have all gotten into barefoot running. Impressively after only 6 months my brother is up to 20 miles barefoot and his wife 12! They are truly inspirational. We did quite a bit of running with them last thanksgiving and really enjoyed it, unfortunately living in Montana makes it difficult to run without shoes year round, since your feet would soon become purple, frost bitten and gangrene from the bitter cold. Where they live in Prescott, AZ. They can run year long in the desert but they do have plenty of thorns. This is why my Christmas gift to them this year were neck needles. These were hand turned from solid sterling bar, first hollowed then threaded, and decorated with some milling accents. 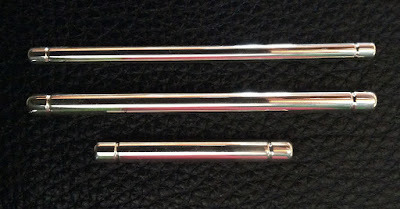 Finally a stainless needle was made that fit in the handle (a sterling silver needle could also be made which would fit in the handle for a portable teishin). Now they always have a needle around their neck for when they "forget" their shoes. This was a recent commission of Shonishin tools for Shaun Sutton from the United Kingdom. I must say I really enjoy my clients from the UK, they are exceptionally polite, kind, and insightful. They also make me feel the acupuncture education there is superior to the United States, or at least the continuing education possibilities are much more extensive. It is always nice to get clients that are full of new ideas and I get to learn something new or have to try some new techniques in my tool making. Shaun sent me a copy of his book; "How Toxic Are My Trousers," and I highly recommend it. Shaun is a man of great sensitivity and thinks very deeply about the way he lives. He has even chosen as an acupuncturist to not use standard stainless needles, because he finds the metal does not resonate with him personally and therefore influences the treatment in a negative way. I feel blessed to work with someone with such high standards that shares my love for silver acupuncture tools. From top to bottom you will find a modified honeybee shaped heragata, a teishin/enshin, and a fish shaped yoneyama. Shaun has a 7 month old daughter so she is one lucky girl! Heragatas are generally flat but this one was made cylindrical so that there are no sharp edges. The blunt end glides smoothly over the skin and has a wonderful warming effect, while the "stinger" may be used to stimulate specific points. The teishin/ Enshin is finer than most enshins with a 9 mm ball. I feel this size is much nicer for general treatment and has a very nice balanced feel. The "fisheyama" has a normal yoneyama tail while the dorsal fin is also sharpened for a larger yoneyama blade surface while the belly is more gentle and round for techniques such as guasha. The nose is good for stimulation of individual points and "fish kisses." 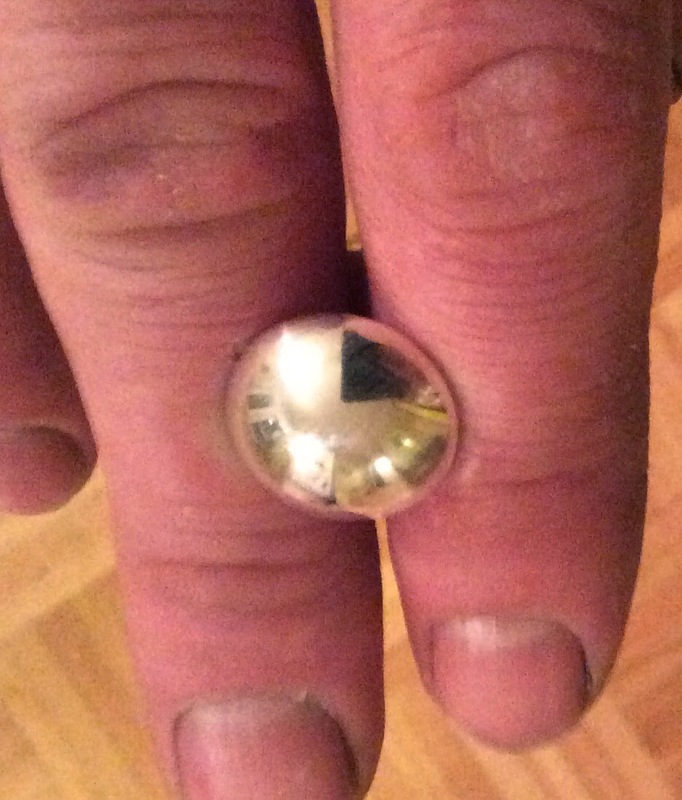 I love setting stones in my yoneyamas so this one received a blue topaz.